The OM7580SM is a 7.0A , ultra low dropout, adjustable linear regulator specifically designed for low voltage, high current applications. Housed in a hermetic package, the dropout of this device is 540mV at full load and as low a 100mV at light loads. 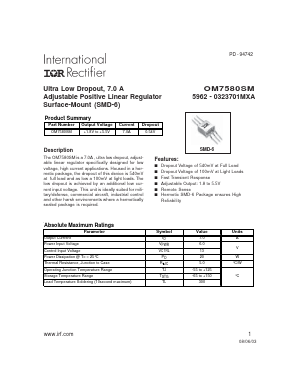 The low dropout is achieved by an additional low current input voltage. This unit is ideally suited for military/defense, commercial aircraft, industrial control and other harsh environments where a hermetically sealed package is required.